The G21 bone cements are indicated for consolidation and stabilization of a fractured, collapsed or compressed vertebral body caused by traumas or pathological conditions, such as osteoporosis or tumours. The bone cements are supplied as two-component systems (power + liquid) to be mixed at the time of application in the operating room; their formulations are designed to offer the user optimal workability and visibility for mini-invasive percutaneous procedures (such as vertebroplasty and kyphoplasty), also when used with small-gauge cannulas. In order to respond to the specific needs of individual health workers, G21 offers a variety of bone cements that differ between them in useful working time and viscosity; their formulations are designed to ease the interdigitation between the biomaterial and the bone structure, and exclude the risk of leakage and the related complications. The radiopaque agent offers the operator the maximum level of safety and control during the procedure while ensuring the development of mechanical properties above the requirements of the reference standards. We suggest to use the cements with the G21 vertebroplasty and kyphoplasty kits. 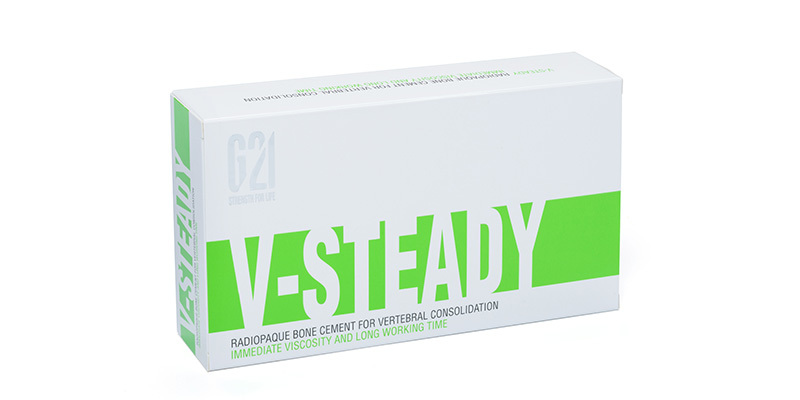 V-Steady is an acrylic-based radiopaque bone cement with immediate development of viscosity and long working time. Ready for use immediately after mixing (in less than two minutes), it maintains this consistency for approximately 9 minutes thanks to its specific formulation that “pauses” the polymerisation reaction. V-Steady bone cement is ideal to perform procedures on several vertebral levels and for who wants a high-viscosity cement that maintains its properties throughout the useful working time. The cement completely hardens in 14 minutes. It can be prepared by hand (bowl and spatula) or using closed or vacuum mixing systems. Because of its viscosity properties, it can be applied with specific systems for controlled injection of high-viscosity cement. low polymerization temperature so as to reduce the risk of thermal shock on the tissues. 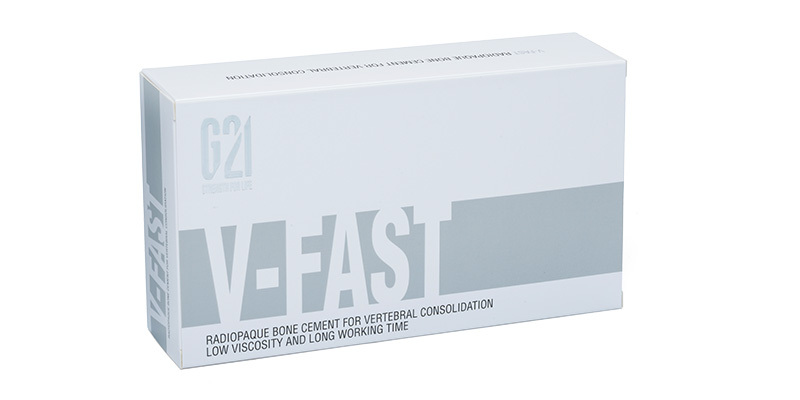 V-FAST™ is an acrylic-based radiopaque bone cements with a low initial viscosity and a long working time. It is particularly suitable for extremely delicate procedures, and where a good time margin before polymerization is required, for example, when performing procedures on several vertebral levels. 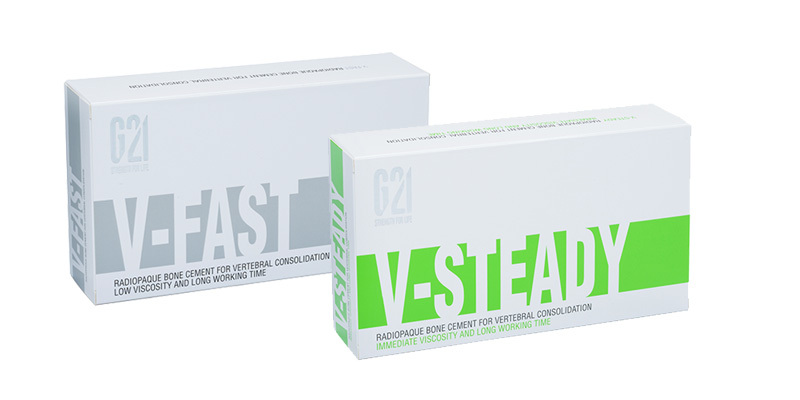 V-FAST™ waiting and working times are indicated where the operation time needs to be reduced. It can be prepared by hand (bowl and spatula) or using closed or vacuum mixing systems. Because of its viscosity, it can be used with syringes or specific controlled injection systems.